The technological sophistication encourage simplifying of various activities such as gadget's battery charging. Yes, through this charger device which has the ability to charge your battery gadgets using solar energy. 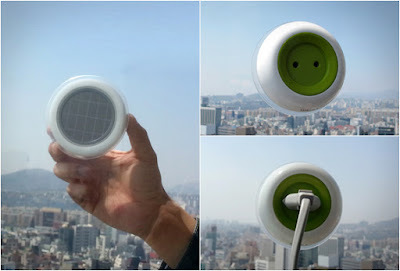 As quoted from Bless This Stuff on Thursday, June 11, 2015, Designers Kyuho Song and Boa Oh have developed the brilliant Window Socket, a portable device intended to enable you to use electricity freely and conveniently in a space restricted in the use of electricity, such as a plane, a car, and outdoors. Simply put, the charger sticks directly to windows and draws solar power to an internal battery, which enables one to either plug small devices into the outlet immediately, or save the stored power for use during nighttime hours. The designers hope to increase the power to 10000mAh and also add a USB outlet in addition to the standard one. Currently, it can provide up to 10 continuous hours of power on a full charge.